Foolish is the woman who goes on a healthy eating kick the same time that Masterchef and Great British Bake Off are back on TV. And very foolish is one who watches Bake Off at the same time as eating today’s recipe, so one can only assume that the fool is indeed me. After nearly a month of no exercise and eating pretty much whatever I want while The Boyfriend was home, it’s now time to get sensible again and eat healthily. Most days anyway, I need my baking Sunday’s now more than ever seeing as he’s flown away again. I was pretty darn determined to not eat dull, boring meals as part of my healthier lifestyle so I have torn through my cookery magazines to find plenty of delicious recipes to keep me going and to keep me interested in eating well. Today’s recipe has absolutely achieved that. I made fennel and halloumi salad from the August 2012 Delicious magazine and it really surprised me. I’ve not eaten a lot of fennel or halloumi before so had no idea how this would turn out, especially with the addition of dried cranberries which I wouldn’t automatically pair with any of the other ingredients. But what do I know, we’ve already established my foolishness after all, and in the end it was a nifty little salad with a tonne of flavour that was also super speedy to make. The only cooking involved was frying the halloumi so it browned and went a little bit squishy. Before today I was a halloumi virgin, and I have to ask why I left it so long as i loved it. 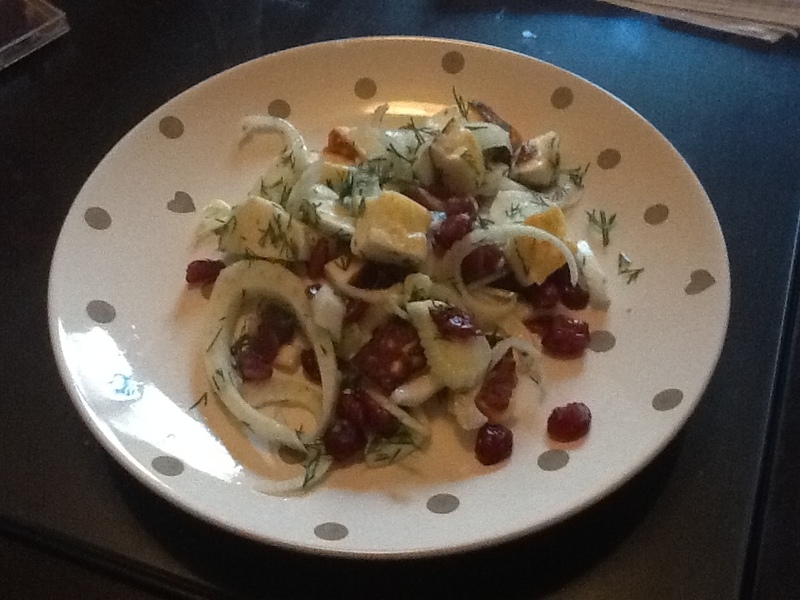 The warm and soft halloumi went really well with the aniseedy crunch of the fennel, while the cranberries added a sour note which made the salad really interesting. It’s not often people say that about salad is it? I put a small portion on my plate thinking it would never fill my (slightly larger than a month ago) stomach but the cheese makes it deceptively filling. Ahhh squeaky cheese, what can’t you do? As well as feeling virtuous by eating a tiny and healthy dinner, I also felt that I was doing my bit to spare an innocent chicken or salmon by declaring my day Meat Free Monday. This is despite the fact that I have a big bag of chicken breasts in the freezer and that my insignificant and completely insincere protest will make not a jot of difference to any chicken whatsoever. And I’m having salmon tomorrow. But it made me feel good, so high five for me! Anyway, it’s good to know that should you seek out salads that are a little more unusual, you will be rewarded with a great tasting dinner that leaves you feeling full and opens your taste buds up to some new flavour combinations.